Middle school @ Al Qamar's excursion to the Pallikarnai Marsh/ Dump. As a part of the Ecology class, the Middle Schoolers went to the Pallikarnai marsh to see the volume of garbage being dumped. And the migratory birds living on the opposite side. As one child said, "On one side was beauty,.on the other, beauty dying." Another said "I hope to work to reduce my waste". 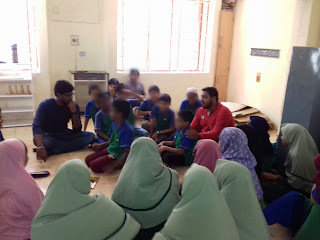 As a follow through, children visited the green home of Mr. Shaju John and were completely blown away. They flipped through a coffee table book written by Mr. John on "The eye of the Marsh.. Pallikarnai, Then and now", saw how Mr. John built his home by recycling waste material - glass, wood. How he uses rainwater harvesting, and has a indoor pond with fish. 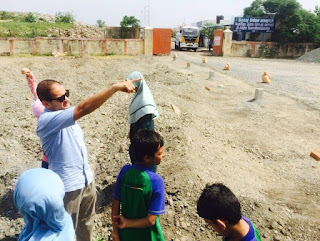 Brilliant excursion which juxtaposed garbage, wildlife preservation and practical recycling. No wonder that Tariq Akbar is now Teacher #1!